Cats Love Fish so why not give them sushi?! Your cat will go crazy for this cute Sushi Catnip Cat Toy! What more could a feline want? High-grade, first quality catnip, certified organically grown in the USA. No fillers 100% fresh catnip. Poly fill stuffed with a catnip packet inside. Plush toys. Making cats happy. 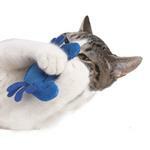 Sushi Catnip Cat Toy - Blue Crab Customer Photos - Send us your photo! Mayonaka loved her new toy! Posted On 12/15/16 by Mary J from Columbus, OH Yes, Mary J recommends this product! Cute toy. I'm giving it to my sister's cat for Christmas so I can't comment much. It looks like it's good quality. I'll ask Muffs after Christmas what she thought. 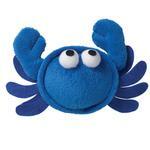 The crab is cute, but it didn't have any catnip scent. My cat won't play with the toy. Posted On 06/30/16 by michelle c from Lake Wylie, SC Yes, michelle c recommends this product! Posted On 03/10/16 by B from Iowa City, IA Yes, B recommends this product! Both of my cats love this little guy! Will definitely be getting more of them in the future. My kittens love this crab so much they carry it everywhere. Posted On 11/01/15 by cindy y from , PA Yes, cindy y recommends this product! This is my cats favorite toy . I bought one of these for my kitten and it is so adorable so I bought one for me! I have it on my desk and he is such a cute little fellow!